BOSTON—Torii Hunter couldn't sleep at night, not with his Los Angeles Angels mired in another losing streak. Their 0-9 record against the Red Sox this season wasn't helping, either. So the Angels outfielder called a players-only meeting before Thursday night's series and season finale against Boston, and the team responded with a 7-2 victory. The Angels had played the Red Sox nine times this season and lost every game. That was one of the many reasons Torii Hunter called a players-only meeting at Fenway Park before the teams played for the final time last night. The Angels are not a contending team this season, a rarity in the 11 seasons Mike Scioscia has been their manager. But they still have plenty of professional pride. “We were bothered by that. They beat us nine times,’’ Hunter said. The numbers are nearly unbelievable. 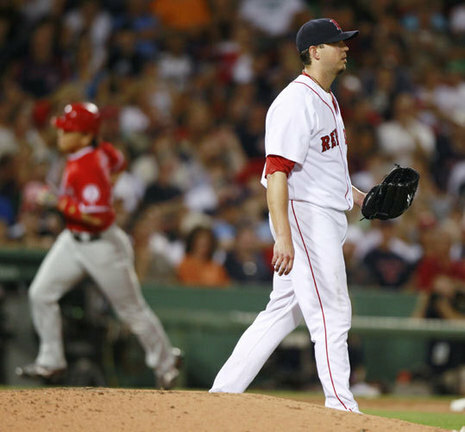 Josh Beckett — the Red Sox’ Opening Day starter — has allowed an astounding 19 runs on 28 hits over 16 innings, his last three starts. And while there are many explanations for his struggles, from too many cutters to little command of his fastball, the bottom line is that the Sox can’t afford to have a starter perform so poorly.